1 of 3 In a bowl, cover bread slices with cold water; let stand 15 minutes. Drain and squeeze water from bread. 2 of 3 In a food processor, combine tomatoes, sweet red pepper, 1 cup of the cucumber, the onion, garlic and 1/2 cup cold water. Process until very finely chopped. Add bread, oil, vinegar, salt and pepper. Process until smooth. 3 of 3 Transfer to a resealable container and chill for 1 hour. 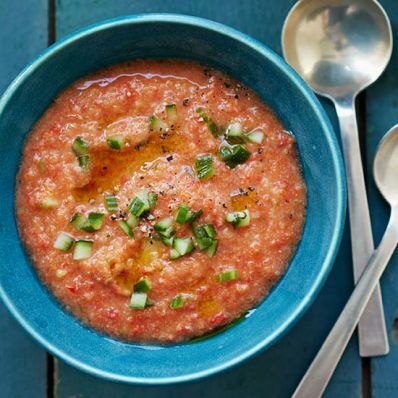 Garnish gazpacho with remaining 1/4 cup cucumber and, if desired, drizzle with additional olive oil and vinegar. Per Serving: 597 mg sodium, 13 g Fat, total, 0 mg chol., 194 kcal cal., 3 g fiber, 3 g pro., 2 g sat. fat, 19 g carb.